Retarus, as a managed service, eliminates the costs and complexity of managing on premise fax and messaging infrastructure. 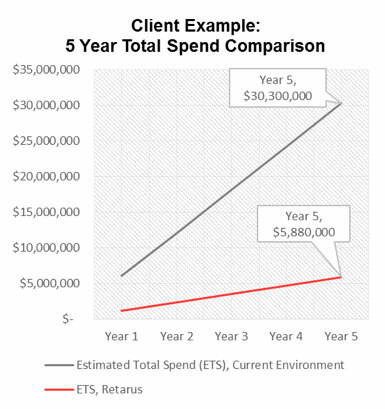 Without the need for telephony, hardware, software and all associated costs, Retarus services provide organizations with a Return on Investment up to 70%, greatly reducing Total Cost of Ownership, and completely eliminating Capital Expenditure. Replacing your fax server and consolidating your IT, changing over to All-IP/VoIP, optimizing your workflows and fulfilling compliance requirements – complex scenarios require from the very beginning an experienced service provider, who knows what is essential for fax. Desktop Fax Services: Retarus offers a critical messaging service suite that provides a robust range of solutions which support enterprise faxing needs. With native integrations into email clients, such as Microsoft Outlook, Lotus Notes, Office 365, and Office applications, users can fax a variety of documents seamlessly from their desktop; minimizing errors, maximizing productivity and meeting corporate compliance standards. Retarus Applications Fax Services: Integrates with any business applications i.e. CRM, ERP, or legacy to send and receive critical messaging documents directly from business applications. Faxolution for SAP completely replaces in-house fax services and requires no hardware, software, installation or maintenance. Certified by SAP, this service has the world’s largest number of SAP connections – over 3,500 – outside of SAP itself. WebExpress: Multi-modal web-based messaging broadcast tool, that enables Marketing, Sales, PR and other departments to send broadcast messages to a distribution list via email, fax, and SMS in a matter of seconds. SMS Services: Retarus Mail2SMS and SMS for Applications allow users to send information from an email account or application to a mobile device. No hardware, software or gateway required. 4,700: Thousands of satisfied customers around the world are communicating smoothly and successfully with Retarus’ services, including Sony, Puma, Honda, Avis, and many more. Most of them directly from their business applications. Fast: Whether it’s 10,000 or 1 million messages – your business-critical documents always reach your recipients without delay. You need a quick solution? In such cases, Retarus can organize your implementation within four hours. Secure: Safe rather than sorry. Retarus’ global infrastructure, with multiply redundant and backed up systems, ensures that your documents arrive at their destinations reliably. Efficient: Consolidate your IT and eliminate over or under capacities. The “pay per use” billing model is always perfectly aligned with your needs. Send and receive documents directly via your business application without having to make any changes to your system. Without needing your own infrastructure. Without installing any hardware or software. Customized: You can count on the professional support of experts to adapt Retarus’ Cloud Services to meet your special requirements. The challenge: Your business needs to keep your B2B supply chain state-of-the-art. Eliminate technology gaps and bring non-EDI partners into your EDI network. And reduce costs by improving efficiency within the B2B supply chain in ways that were previously unachievable. The solution: Retarus’s broad portfolio of 100% outsourced business integration solutions and EDI Services. Our proven transaction-based services take you wherever your business relationships need to go – swiftly, reliably, and economically. EDI Managed Services – Outsourced EDI services to fit your needs and your budget. EDI VAN– World-class EDI transaction engine, faster than traditional VANs. Web EDI – Lets EDI companies transact with non-EDI partners, opening up new partnerships. EDI Service Bureau- – Bridges gap between retail hubs and non-EDI suppliers to expand your business. Retarus’s broad portfolio of 100% outsourced EDI solutions provides companies with an array of options to optimize the efficiency, reliability, and reach of your electronic supply chain while reducing costs, infrastructure, and overhead. The challenge: The amount of data your teams are sharing between business units – and with your outside partners and customers – is exploding. It needs to be managed. Homegrown, unsecure, unmanaged messaging must be replaced with a high-speed, highly-managed enterprise-wide solution that protects the business. The solution: Retarus’s Managed File Transfer (MFT) Services. You can consolidate all of your company’s communications streams through a single secure connection to our global MFT service, where your business messaging can be managed, secured, and audited. The challenge: Your customers, partners, and other stakeholders expect to be notified in the format they prefer most, whether it’s SMS, voice, email, or even fax. You need a single automated notifications platform that can handle this challenge efficiently and economically. The solution: Retarus Notifications offers a “single source” multi-modal messaging solution that enables customers, partners, and other constituents to receive messages in the format they will most likely respond to, helping to drive incremental revenue and growth for your business. 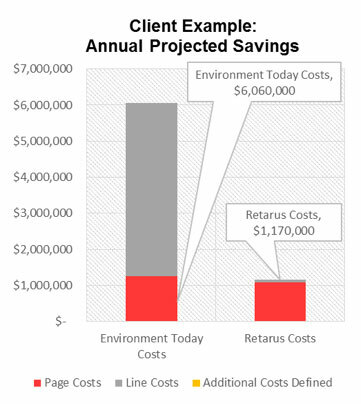 Retarus’s cloud-based platform also eliminates the IT infrastructure costs, customer service delays, and human errors associated with having to manage multiple messaging systems. The challenge: You need to communicate, both internally and externally, in compliance with a wide range of security, confidentiality, and record-keeping standards. If you can’t, you’re putting your customer relationships, business partnerships, and reputation at risk. The solution: Retarus Secure Messaging is a 100% outsourced, cloud-based secure messaging solution that integrates seamlessly with your back-end systems, strengthens compliance with both industry and government security standards, and makes it easy to transition your current environment to a 100% secure e-mail platform. This is what we call, peace-of-mind.